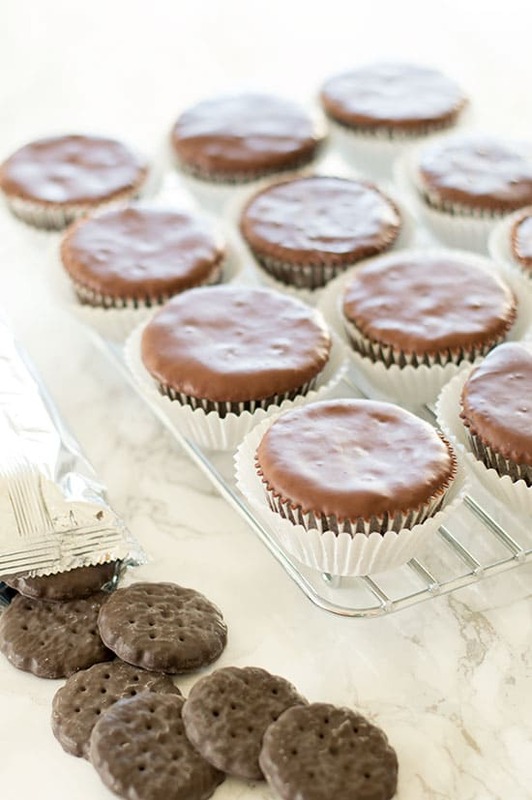 These Thin Mint Cupcakes are moist chocolate and peppermint cake covered with a smooth chocolate coating. 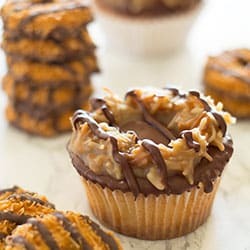 A delicious cupcake version of the most popular Girl Scout cookie. Today we tackle the best-selling Girl Scout cookie, Thin Mints! Thin Mints are the favorite cookie of almost everyone I know, so pressure was high to get this cupcake right. And you know what? I feel pretty good about these. 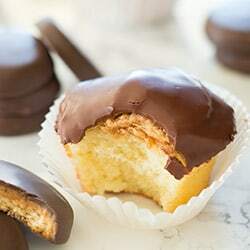 Thin Mints are a pepperminty, crunchy chocolate cookie dipped in chocolate. They are good at room temperature but best when stored in the freezer and eaten cold. So my Thin Mint Cupcakes are my favorite chocolate cake base infused with peppermint and dipped in a smooth chocolate coating. They are excellent at room temperature but also very, very good after being popped in the freezer and chilled. The flavors in this one are pretty on point because chocolate and peppermint are generally going to taste like chocolate and peppermint. So my Thin Mint Cupcakes taste quite a bit like cookie Thin Mints, which translates to, AMAZING. Texture is where these cupcakes shine. The chocolate cake is moist and light, laced through with the fresh taste of peppermint. And the hard chocolate coating provides a delightful contrast, and really looks just like the top of a Thin Mint! Girl Scout cookie season generally runs through April, so very soon we will have to say goodbye to our favorite cookies (whichever ones they may be) until next year. Fortunately, these cupcakes will be here to tide you over in the mean time. 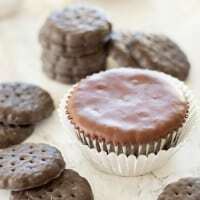 These Thin Mint Cupcakes are moist chocolate and peppermint cake covered with a smooth chocolate coating. 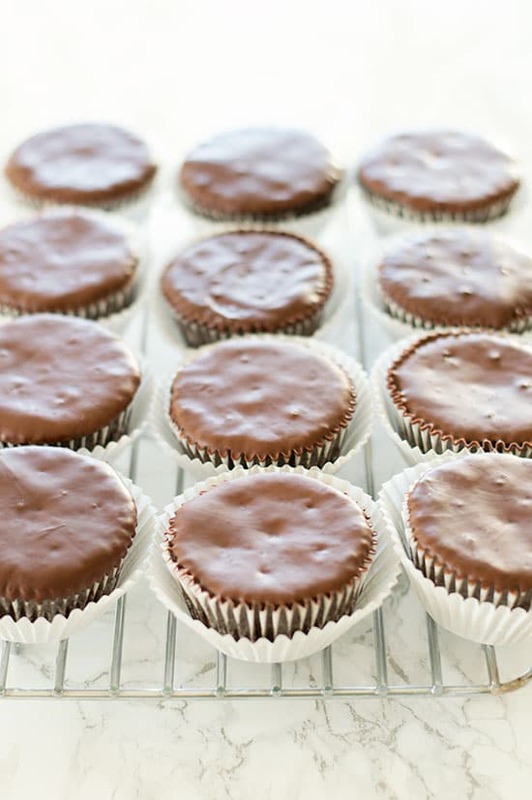 A delicious cupcake version of Thin Mints. Preheat oven to 350°F and line cupcake cups. In a large bowl, sift together flour, sugar, cocoa powder, baking soda, baking powder, and salt. In a medium bowl, whisk together buttermilk, oil, egg, and vanilla. Add wet ingredients to dry and slowly whisk until combined. Pour in the coffee and peppermint and whisk until batter is smooth. The batter is going to look alarmingly runny at this point, but don't worry! It's supposed to look like that. Fill cupcake cups just 2/3 of the way full, no higher. This should make 15-16 cupcakes. If you have one, transferring the batter to a liquid measuring cup and pouring it into the cupcake cups makes this process much tidier! Bake for 17-20 minutes. Try not to open the oven door too often or jostle the pan while cupcakes are cooking. It can cause them to sink. Cupcakes are done when a toothpick inserted into the center comes out clean. Allow to cool in the cupcake pan on a wire rack before adding chocolate coating. Place chocolate and oil in a small microwave-safe dish wide enough for cupcake dipping. Microwave on medium in 30 second bursts, stirring in between until all chocolate is melted. Stir vigorously until chocolate is smooth and shiny. Dip the tops of the cupcakes in the coating and allow the excess to run off. If you'd like, you can use a toothpick or cake tester to poke holes in the top of the cupcakes like the holes on the cookies. Place on a wire rack to dry. Chocolate will set more quickly in the refrigerator but will set if left on the counter in about an hour. 3/4 teaspoon peppermint extract was plenty for me, but if you love peppermint, you could kick it up to 1 teaspoon. Cupcakes will keep at room temperature in an air-tight container for up to 3 days. Small-batch Instructions: To halve the recipe, just remember that there are 4 tablespoons to a quarter cup, so half of 3/4 cups and 2 tablespoons of flour is 1/4 cup and 3 tablespoons and half of 1/4 cup and 2 tablespoons of cocoa powder is 3 tablespoons. You’re also going to have to split an egg for this one. The best way to do that is to whisk the whole egg in a very small bowl and use half of it (about 1 tablespoon and 1 teaspoon or 1 ounce/28 grams by weight). Freezer Instructions: Cupcakes will keep in an air-tight container in the freezer for up to 2 months. Allow to come to room temperature on a metal rack to prevent the bottoms from becoming soggy or even better, eat chilled. What could be better than chocolate and peppermint in a cupcake? These cupcakes look and sound delicious Tracy! Thin mints are my favorite of all the Girl Scout Cookies. I love a recipe that combines chocolate and mint – looks fantastic. Which cookie are you going to create with next? Wow these cupcakes look delicious!! And so clever to add the mint on top! I can’t wait to try it!! 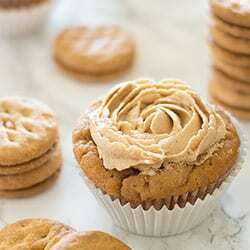 Such easy recipe for an amazing treat!! 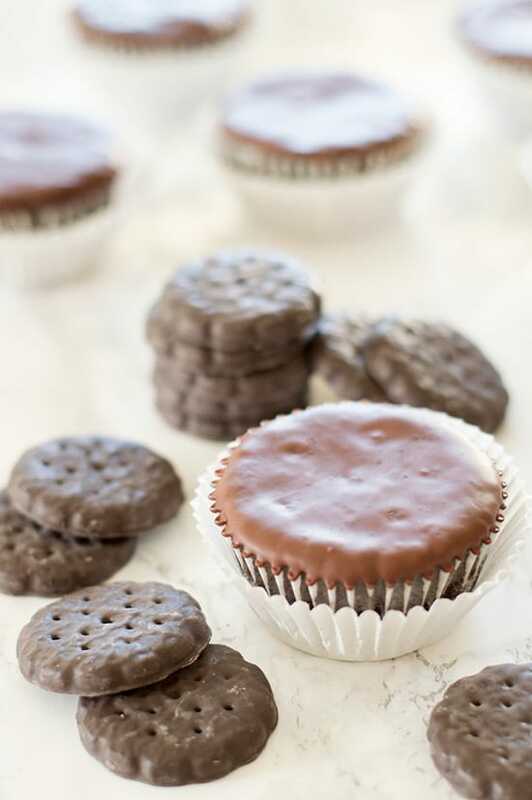 I love thin mints, what a great idea to do them as cupcakes! Pinning and sharing!